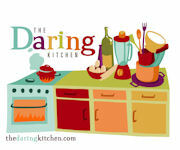 Culinary Diary of a Modern Mrs.
Those of you who are lucky enough to have spouses or partners who love to join you in the kitchen, I envy you. Dr. O is wonderful (really!) and has many redeeming qualities, but he does not cook. He does not slice, he does not chop, he does not stir. He rarely even toasts. Combine the water, sugar and kosher salt in the bowl of a stand mixer and sprinkle the yeast on top. Allow to sit for 5 minutes or until the mixture begins to foam. Add the flour and butter and, using the dough hook attachment, mix on low speed until well combined. Change to medium speed and knead until the dough is smooth and pulls away from the side of the bowl, approximately 4 to 5 minutes. Remove the dough from the bowl, clean the bowl and then oil it well with vegetable oil. Return the dough to the bowl, cover with plastic wrap and set in a warm place for approximately 50 to 55 minutes or until the dough has doubled in size. Preheat the oven to 450°F. Line 2 half-sheet pans with parchment paper and lightly brush with vegetable oil. Set aside. Bring the 10 cups of water and the baking soda to a rolling boil in an 8-quart saucepan or roasting pan. In the meantime, turn the dough out onto a slightly oiled work surface and divide into 8 equal pieces. Roll out each piece of dough into a 24-inch rope. Make a U-shape with the rope, holding the ends of the rope, cross them over each other and press onto the bottom of the U in order to form the shape of a pretzel. Place onto the parchment-lined half sheet pan. Place the pretzels into the boiling water, one by one, for 30 seconds. Remove them from the water using a large flat spatula. Return to the half sheet pan, brush the top of each pretzel with the beaten egg yolk and water mixture and sprinkle with the pretzel salt. Bake until dark golden brown in color, approximately 12 to 14 minutes. Transfer to a cooling rack for at least 5 minutes before serving. This recipe produces absolutely amazing results. This is the best soft pretzel I’ve ever had – at a stadium, a bakery, anywhere. 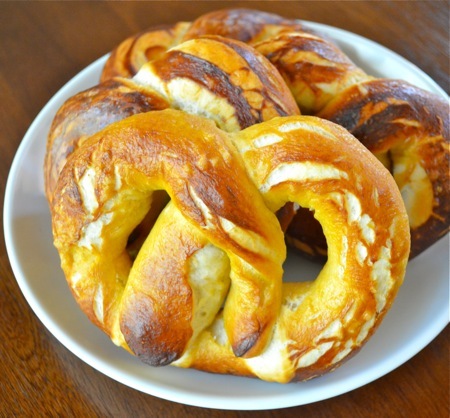 If you’re a pretzel person (and I am! ), we’re talking ecstasy. We tried honey mustard and spicy brown mustard as dipping sauces; the spicy brown won, hands down. The pretzels would be fantastic with cheese as well. We had a few leftover pretzels (hard to believe! ); some were sliced horizontally for sandwiches, others were reheated in the microwave for 25 seconds on high. The reheated pretzels weren’t quite as good as fresh out of the oven, but they still beat the heck out of a SuperPretzel. TIPS: If you don’t quite get how to form the pretzels, watch Alton do it here. Let the holiday baking begin! I certainly started mine off on the wrong foot yesterday evening when I got (really!) distracted and left the flour, baking powder, and salt out of today’s recipe… As you can imagine, my cookies melted into a puddle in the oven. I’m always one to try, try again, though, so I gave the recipe another shot this morning. Success! Put butter and cream cheese in the bowl of an electric mixer fitted with the paddle attachment; mix on medium speed until creamy. Mix in granulated sugar. Add egg, lemon zest, and lemon juice; mix well. Sift together flour, baking powder, and salt into a medium bowl; mix into butter mixture on low speed. Preheat oven to 375°F. Place a small amount of the dough in a pastry bag fitted with a large round tip. Holding tip very close to the surface, pipe 2-inch rings onto baking sheets lined with parchment paper; space 1 inch apart. Gently push down any peaks in the piped dough. Refill pastry bag as needed with remaining dough. Bake cookies until golden brown on bottom, about 10 minutes. Let cool on sheets on wire racks, and sprinkle with confectioners’ sugar. Cookies can be stored in airtight containers at room temperature up to 3 days. What a great cookie! I’m especially excited that the recipe worked at high altitude with only one minor modification (the scant teaspoon of baking powder instead of a whole, and I’m not sure the change was even necessary). The dough really doesn’t expand much. 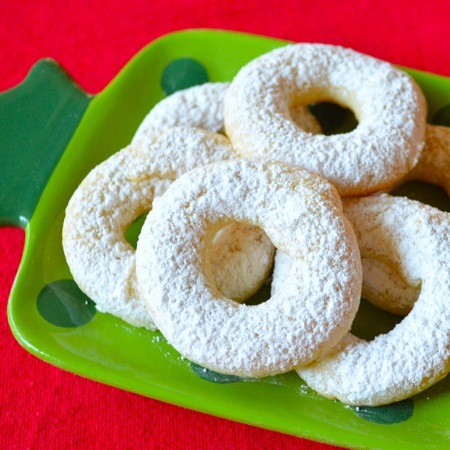 The flavor of the cookie is wonderful; it isn’t too sweet, even with the confectioners’ sugar sprinkling, and you definitely get the citrus from the lemon (though it isn’t overpowering). The texture is somewhere between a sugar cookie and shortbread – crisp, but not dry – and I think these cookies would stand up well when transported (perfect for a cookie exchange). The only downside to the recipe is that it does take some time and effort to pipe the cookies; the dough is pretty firm, so it’s a bit of a workout. I tried putting the dough in a cookie press after reading a comment on the original recipe, but that was a grand failure. The upside to piping is you can do pretty much whatever shape you want. I tried bows (per the original recipe), rings, squiggles, hearts, and spirals, but liked the rings the best. If you try a different shape or size, just be sure to watch them in the oven. I burnt the heck out of my first batch because I left my 2-inch cookies in for the 12 minutes recommended in the original recipe; that baking time was intended for 3 1/2-inch cookies. For as much as I love making decorated sugar cookies, I often wish the process could be shorter. It takes several hours (not all hands-on time, thankfully!) to even get to the point where you have cookies to ice. Icing then takes a minute or so per cookie and they have to rest for at least four hours (!!!) before you can pipe anything on top. I get exhausted just thinking about it. So when I saw this recent cookie pop project in a Fancy Flours e-mail, I knew I had to give it a try. The cookies were so cute, but they didn’t have any icing. I am completely in love with my regular cookie recipe (No-Fail Sugar Cookies), so I decided to use my usual recipe with their technique. I have made hundreds and hundreds of sugar cookies over the last five years, but I had never colored the dough before. Talk about an easy way to dress things up! I used Wilton’s gel paste food coloring in rose, and I added it after the butter and sugar were creamed but before the egg, vanilla, and flour mixture. Once the dough was chilled and firm, I rolled it as usual and cut it with a 2-inch heart cookie cutter. I put each heart on top of a popsicle stick (my stash of white candy sticks is MIA, so I used what I had) and pressed the dough gently so it would adhere. Fancy Flours suggested silver dragées in the corner of each heart but I had pearl ones; again, I used what I had. My perfect baking time for 2-inch cookies was 8 minutes at 350°F. I cooled the cookies for five minutes on the baking sheets before carefully transferring them to wire racks to cool completely. Based on the scale of dragée to cookie, I’d say Fancy Flours used a 1 1/4-inch cookie cutter. I used a 2-inch cutter. I think the white candy sticks look nicer, but the popsicle sticks will provide better support for a larger cookie. I experimented with dragées around the entire perimeter of the cookie, but the results weren’t good. Some of them dissolved a bit and shrunk during the baking process, which was really obvious when there were 10 or so per cookie. One is perfect (and less time-consuming to place). You could make a really cute Valentine’s Day “bouquet” with these if you stuck the bottom of the sticks into craft foam (maybe shaped like a heart and painted red or pink?). They’d make great gifts individually wrapped and tied with a bow as well. 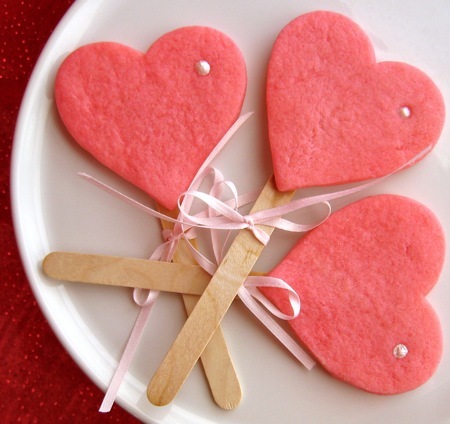 Update 2/15/11: I baked some mini (1 1/2-inch) heart cookies yesterday afternoon and the dragées held up beautifully. I think the shorter baking time (5 1/2 – 6/1/2 minutes for the minis) made all the difference. Heart-shaped Red Hots worked well as decorations for both the mini and larger cookies. My mom and I have been working on our Thanksgiving menu for the past week or so. Choosing our dishes for the main meal was a snap, but we got stuck on dessert. I could think of at least five or six things I would love to serve, but we would have ridiculous amounts of leftovers. (Leftover turkey? Yes, please. Two weeks’ worth of leftover pie? Trouble.) We finally agreed that we should have something pumpkin (Muirhead Pecan Pumpkin Butter Dessert Squares), something apple (the Caramel Apple Pie I made last year), and something pecan (my dad’s favorite!). As much as I enjoyed it the first time I made it, I knew I didn’t want to make Martha’s Maple-Nut Tart again after the struggle I had getting it out of the tart pan. 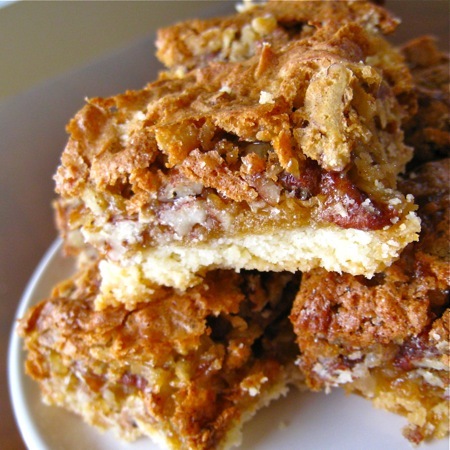 I found a basic recipe for Pecan Bars on her site, though, and thought they could be a fun, easy-to-serve option. To make the crust, I used the paddle attachment on my stand mixer to beat together 2 sticks of unsalted butter, 1/2 cup of confectioner’s (powdered) sugar, and 1 teaspoon of salt until light. On low speed, I beat in 2 cups of all-purpose flour until the mixture formed a mass. I transferred the dough to a 9 x 13-inch pan and used a sheet of plastic wrap to press it evenly into the bottom of the pan. I discarded the plastic wrap and baked the crust at 375°F until golden (25 minutes). While the crust baked, I made the filling. In a small bowl, I whisked together 2 more tablespoons of all-purpose flour, another teaspoon of salt, and a scant 1/2 teaspoon of baking powder. Using an electric mixer, I beat 2 large, room-temperature eggs with 1 1/2 cups of packed light brown sugar and 1 tablespoon of dark corn syrup until light. I folded the flour mixture into the egg mixture, followed by 2 cups of pecans (coarsely chopped) and 1 cup of sweetened flaked coconut. When the crust had finished baking, I gently spread the filling over it and baked until the filling was set (20 minutes). Immediately after the pan came out of the oven, I ran a metal spatula around the edges and then set the pan on a wire rack to cool. Once cool, I cut the bars into 24 servings. First things first: If you’re into salty-sweet things (I am! ), these bars are absolutely delicious. You get a buttery, flaky, tender crust on the bottom, a chewy center, and oodles of coconut-pecan flavor. If you don’t like sweet things, these may be too much for you; substituting unsweetened coconut for the sweetened coconut would dial things back a bit. I get so incredibly excited each time I find a recipe that is so fantastic I know I’ll make it, quite literally, for life. 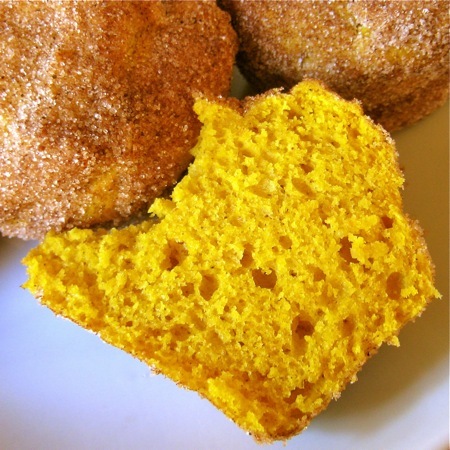 Today’s recipe – Pumpkin Doughnut Muffins from the November 2010 issue of Everyday Food – is one of those recipes. Active time: 20 min. | Total time: 1 hr. Preheat oven to 350°F. Butter and flour 12 standard muffin cups. Make batter: In a medium bowl, whisk together flour, baking powder, baking soda, salt, nutmeg, and allspice. In a small bowl, whisk together buttermilk and pumpkin purée. In a large bowl using an electric mixer, beat butter and brown sugar until light and fluffy. Beat in eggs, one at a time, scraping down bowl as needed. With mixer on low, add flour mixture in three additions, alternating with two additions pumpkin mixture, and beat to combine. Note: Freeze muffins up to 3 months. Reheat in a 350°F oven, then coat in butter and sugar. High-altitude adjustments: I’m not sure I actually needed to make these changes since this was the first time I made this recipe, but I went with my high-altitude baker’s intuition. I’m so pleased with the results that I will make these changes again next time. I added 1 tablespoon of flour to the batter (3 cups plus 1 tablespoon total). I cut the baking powder by 1/4 teaspoon (2 1/4 teaspoons total). I used a scant 1/4 teaspoon of baking soda instead of a full 1/4 teaspoon. The interior of the muffin had a mild pumpkin flavor and wasn’t overly sweet. The texture was light, airy, and moist with a beautiful crumb. They were a bit more cake-like than a traditional muffin, I think. 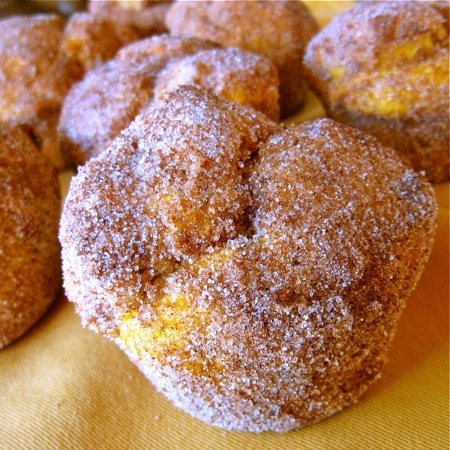 The cinnamon-sugar coating was absolutely divine, and the amount of sugar and spice on the outside was a perfect complement to the inside of the muffin. In short, they were amazing. I have visions of feeding these to houseguests, lounging with them on Sunday mornings, and bringing them to brunches year after year. I swear, these are the best muffins I’ve ever made. In support of this theory, another doctor at my husband’s office lightheartedly suggested he might marry me after sampling them. They’re THAT good. Give them a try! TIPS: When I need to bring an amount of butter to room temperature quickly and I don’t want to risk overdoing it in the microwave, I thinly slice the butter and let it sit on a cutting board. In five minutes or so, it’s ready to go. Also, I always use room-temperature eggs when I bake. To bring eggs to room temperature quickly, I put them in a container of lukewarm water for three to five minutes. The requirement of last week’s gourmet club meeting was to cook with five ingredients or fewer. Although I ultimately settled on another recipe for the dinner party, this Ginger Pumpkin Tart from Claire Robinson is super easy and very seasonally appropriate. For the filling, I whisked together one 15-ounce can of pumpkin purée (not pumpkin pie filling! ), 3/4 cup of sweetened condensed milk, 2 large egg yolks, and a pinch of salt (salt, pepper, and water are considered “freebie” ingredients) in a medium bowl. I poured the filling into the cooled crust, returned the pan to the oven (still on a rimmed baking sheet, still at 350°F), and baked the tart until it was set (30 minutes). I removed the tart from the oven, cooled it to room temperature, and then chilled it for several hours in the refrigerator before serving. For being so simple, this is pretty darn tasty. It’s essentially like eating pumpkin pie, except with a ginger cookie crust. Like any good pumpkin dessert, though, it really isn’t complete without a bit of sweetened whipped cream… I know this takes the recipe over the five-ingredient limit, but it’s essential. Want to try something a bit more gourmet with homemade pumpkin purée and chocolate? 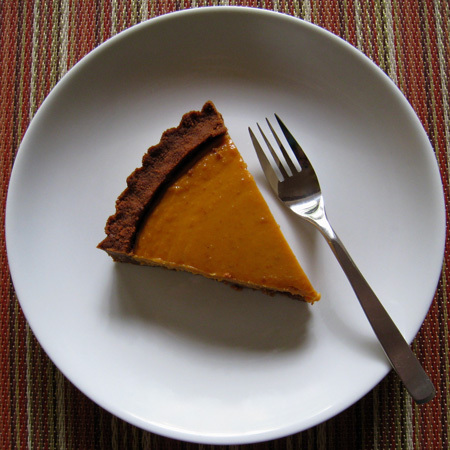 Check out last year’s Chocolate-Pumpkin Tart post. TIPS: Apparently, the canned pumpkin supply is back to good after last year’s shortage. Yay! Also, the one “mistake” I made with this recipe was to push too much of the crust up the sides instead of leaving more on the bottom. That thick crust looks absolutely gorgeous, but it was pretty difficult to cut once I got to the edge. Sticking a fork through it? Impossible. We had to pick up the crust and eat it like a cookie. (Still delicious!) Next time, I’ll even things out a bit. I always get really excited when one of my favorite baking recipes from Dallas works here in Denver without any high-altitude modifications. 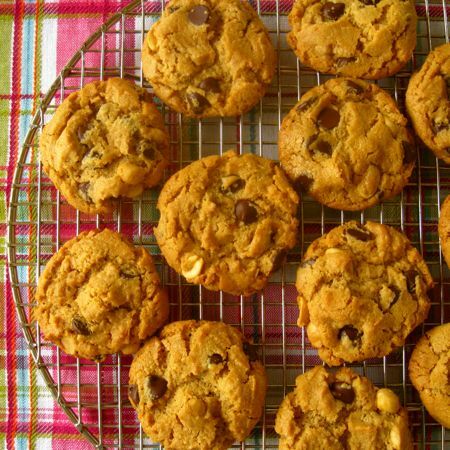 Today’s recipe – Flourless Peanut-Chocolate Cookies from the March 2005 issue of Everyday Food – is one of those recipes. I loved these cookies so much when we were in Dallas and got so many compliments on them… I’m just thrilled I can share them here as well. And let me tell you something, folks: These cookies are not only delicious, they’re ridiculously easy. Like, you-don’t-even-need-a-mixer easy. Here’s how I made them. In a large bowl, I stirred together 1 cup of creamy peanut butter, 3/4 cup of granulated sugar, 1 large egg (lightly beaten), 1/2 teaspoon of baking soda, and 1/4 teaspoon of table salt until well combined. Next, I stirred in 3/4 cup of semisweet chocolate chips and 1/2 cup of roasted salted peanuts. From here, I deviated a bit. The recipe says to use moistened hands to roll heaping tablespoons of dough into balls. I used my 1 1/2-inch cookie scoop for the first batch (with the dough leveled instead of heaping) and my hands for the second batch so I could see which method gave me the best cookie shape. (The scoop won by a mile!) The recipe also said to bake all the cookies at once with one rack in the top third of the oven and one in the bottom third. I feel like I get more consistent results when I bake my cookies in the middle of the oven, so I decided to do separate batches. With that said, I placed the dough balls about 2 inches apart on parchment-lined baking sheets. (I ended up with 21 cookies.) I baked each batch at 350°F until they were golden and puffed (13 minutes in my oven). I cooled them on the baking sheet for 5 minutes before transferring them to a wire rack to cool completely. Oh, heavens. They were just as I had remembered, except maybe ever so slightly less puffed than they were in Dallas. No matter… The Queen of Portion Control (me, as often as I can stand it) has already eaten two of these and it isn’t even 5 p.m. yet. The cookies are very peanut butter-y, and I love the chunky texture created by the whole peanuts in the dough. They aren’t soft and chewy but they certainly aren’t crisp either… They’re somewhere in between. They’re a little bit crumbly like a good shortbread, which is another thing I can hardly resist. So anyway, if you like peanuts and chocolate, make these! You’ll enjoy them. And my fellow high-altitude bakers can rest easy knowing this won’t be yet another batch of cookies that spread into sad, crispy discs.